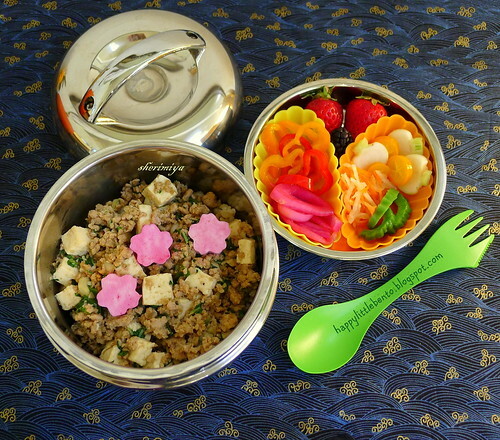 Sakura Ma Po Tofu Bento, a photo by sherimiya ♥ on Flickr. MisterMan's ma po tofu gets an accent of three beet-dyed sakura cut tofu "blossoms" floating atop his meal. Did you enjoy the cherry blossoms in your neighborhood? Seems this year I noticed quite a few specimen trees that I never noticed in years past. There's one fabulous double-blossomed tree that I pass every single day, and somehow I never realized its striking beauty until the past couple weeks. I can't take a picture because there's no parking, but I've been slowing down to appreciate it each day. So here's my homage to that lovely spring display. His upper tier has a couple of the last market strawberries, and some cups of: marinated baby bell peppers and pickled red onions; pickled turnips with sliced kumquats, pickled carrots and daikon, and pickled bittermelon. The baby turnips recipe called for lemon, but I substituted kumquats -- it's delicious this way! I think the kumquats would be nice by themselves as well. They are an unusual fruit in that the flesh and juice are tart but the skin is sweet. Have you had them? And this batch of bittermelon was marinated in equal parts vinegar and pineapple juice. It's a lot more palatable this way. I think this method is a winner! I may put together a post of all my pickling experiments, in case you have a hankering to try any of these, and so that I can remember what I've tried so far. What do you think? I would love to see your pickle recipes :) I've never tried bitter melon before because I didn't know what to do with it. I love that bright fresh vegee tier. It looks like summer!